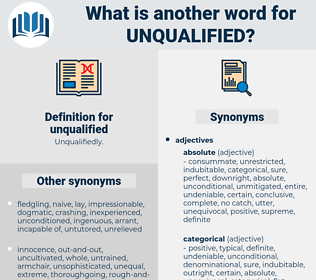 What is another word for unqualified? untrained, well-qualified, absolute, unquestioning, full, fuller, unconditioned, unfailing, unimpeded, unwavering, undiminished, non-qualified, substandard, low-skilled, unambiguous, unrestrained, unsatisfactory, staunch, skilled, categorical, wholeheartedly, unquestionable, uncritical, unbounded, unswerving, complete, outright, undisputed, unflinching, conditional, total, unmistakable, utter, non-restricted, steadfast, all-out. unreserved, unskilled, wholehearted, undivided, unmitigated, unfettered, unequivocal, unstinting, whole-hearted, unhindered, resounding, incompetent, ineligible. conditional, ready, prepared, temporary, indefinite, suitable, competent, tentative, able. doubtful, confined, selective, equivocal, modified, hedged, dubious, bounded, all-around, specialized, technical, demarcated, protean, uncertain, versatile, seasoned, overqualified, dedicated, questionable, trained. The importance of legislation for the permanent increase of the Army is therefore manifest, and the recommendation of the Secretary of War for that purpose has my unqualified approval. During the three days which followed the amateur fireman worked so hard to win the approval of his teacher that Mr. Fernald finally told him he was trying to do too much, and cut down his tasks nearly one half, an act which won for him the unqualified approval of Ninety - four's crew.